Lampe Berger | Chicago's Pipe, Cigar & Tobacco Store | Iwan Ries & Co. 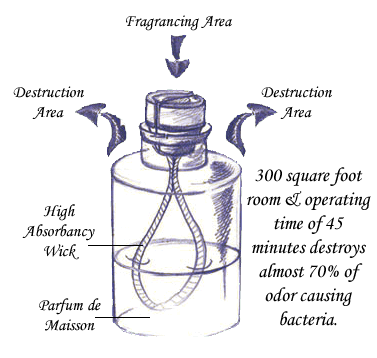 Simply, the Lampe Berger removes odors, kills bacteria and fragrances the air. Developed by Monsieur Maurice Berger, a pharmaceutical chemist, each lamp features, under its’ stylish cap, a patented catalytic burner that destroys odors and helps purify the air, eliminating up to 68% of any airborne bacteria before the fragrance is dispersed. :: Many other forms of household pollution. The Lampe Berger comes with simple instructions and is safe to use. Just add fragrance, then insert the wick/burner, and allow the wick to soak for 20 minutes. Light the burner for two minutes and extinguish. After the purifying process occurs, the fragrance then disperses into the air. 45 minutes are all that is necessary to fragrance a room of up to 300 square feet. To stop fragrancing, simply cap.